For most imaging procedures, the patient lies on a table, which is then placed in the proper position. 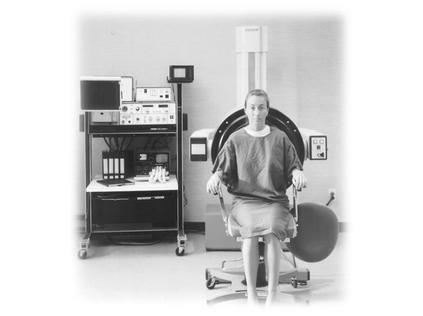 In some cases, the table restricts accessibility of the imaging equipment and patient comfort. The Imaging Chair puts the patient at ease, and provides alternative patient positioning for nuclear medicine procedures. The Imaging Chair is fully adjustable. With the back support and armrests in place, it is a chair, which can swivel 360º. 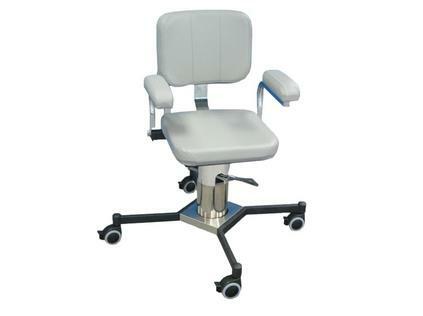 Once wheeled to the proper location, the chair can be anchored while the patient is seated by engaging the foot-operated wheel locks on the four casters. The height of the chair can be increased from 41" to 48" by stepping on the foot pump arm. Hold the arm down and the chair slowly lowers to its minimum height. If you raise the foot pump arm, it locks into that position, which restricts the swivel action of the chair. At the rear of the seat cushion is a locking handle which allows you to move the seat of the chair 4" to the left or right, while the base remains anchored. For lateral and posterior access, the back support and armrests drop out of the way with a simple tug of the corresponding pull pin. The seat and back are upholstered with 2" foam and vinyl cover. 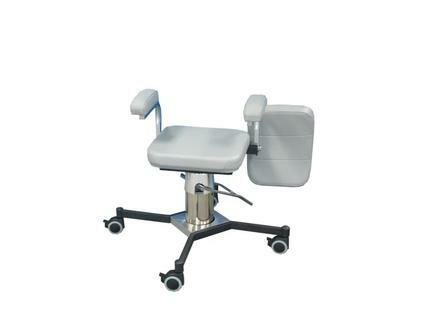 The wide armrest allows the Imaging Chair to double as an injection chair.